Houston has one of the busiest, yet least congested airport systems in the U.S. The Houston Airport System (HAS) ranks as one of the largest multi-airport systems in the world. The system comprises George Bush Intercontinental Airport (IAH), William P. Hobby Airport (HOU) and Ellington Airport (EFD). HAS served more than 54.1 million passengers in ’17, a 0.8 percent decline from the previous year. HAS also saw over 461,400 metric tons of air freight move through its gates, an increase of 4.3 percent over ’16. IAH, Houston’s largest airport and the second largest hub for United Airlines is the 15th busiest airport in the U.S. for total passenger traffic according to the FAA. IAH offers daily nonstop and direct flights to major cities in Asia, Canada, Europe, the Middle East, Oceania and South America. 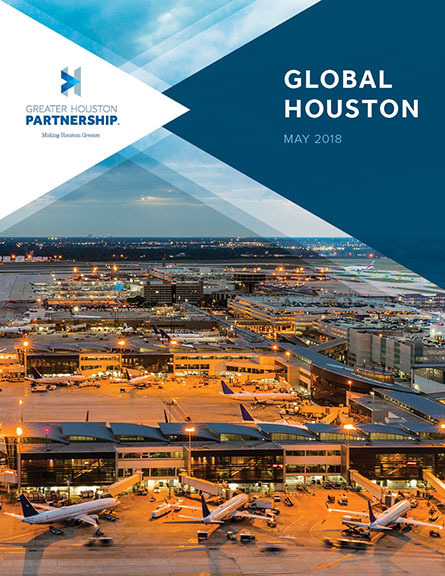 In ’17, it received a 4-star rating from SkyTrax, a global air transport rating organization, making Houston the first city in the U.S. to boast two airports with 4-star Skytrax ratings. HOU, Houston's original municipal airport, handles domestic and international passengers for four airlines and is a key hub for Southwest Airlines. HOU ranks as the nation’s 35th busiest airport. HOU earned the SkyTrax 4-star rating for the third straight year in ’17. regional headquarters of the US Coast Guard.